I’ve been a little slow with this one! Back at the end of January Liz at Eternal Lizdom invited her readers to request an interview from her, which I duly did. Shortly afterwards, her questions arrived in my inbox and I opened a draft post, began to write, got stuck and it’s been sitting there ever since. Today I determined to finish – and here it is. This is one of those pass-it-on meme type things so if you want me to interview you, leave a comment and say “Interview me!” and I’ll send you 5 questions to answer. Liz also invited her readers to ask their own questions of her, that seems fun too so if there’s anything you want to know about me, ask away! 1. What’s in your fridge? What do you have to always have in your kitchen? 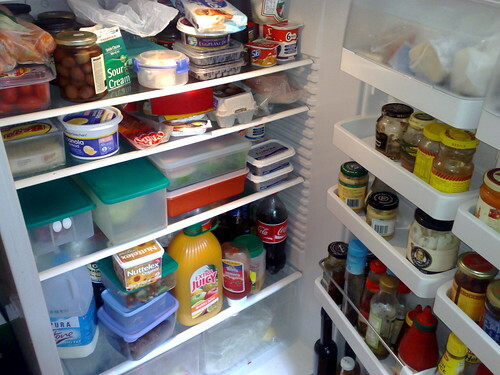 Brave enough to share a picture of your fridge or pantry? I like having a well stocked fridge and pantry so the answer to both of the first two parts of this is usually much the same. These are things that are in my fridge pretty much all the time: milk, cheeses (low fat slices, fetta, brie, smoked cheddar, edam), ham, salami, devon, butter, margarine, eggs, bacon, pickles (dill, sweet mustard, onions), mustards (dijon, wholegrain, american), kalamata olives, capers, anchovies, juices (breakfast, lemon, lime), salad dressings (balsamic, coleslaw), sauces (soy, fish, oyster, sweet & sour, worcestershire, tartare, cocktail, tomato, BBQ) mayonnaise, spreads (jams, lemon curd, lime marmalade), minced garlic, chili paste, wasabi, carrots, tomatoes, baby spinach, cos lettuce, shallots, cucumber, broccoli, mushrooms, lemons, grapes, apples, low fat sour cream, yoghurt. Here’s a photo of my fridge post-party after yesterday’s BBQ, the bottle of Coke makes me cringe, I hate the stuff, but the containers full of left-overs will make meals today nice and easy. 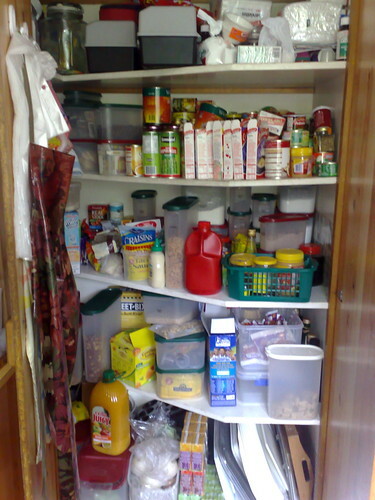 My pantry I hate, it’s a horrible design with half the shelving tucked into the corner on the left and accessible only by people with extra long arms and x-ray vision. The oven used to be above the bench beside the pantry, when I got a new one it wouldn’t fit in the same spot so Adam built these shelves for me to sit in the now empty space. My pantry shelves go right back to the wall behind the spice rack. 2. What’s your parenting philosophy? Do you wish there was something you’d done differently? What concerns do you have as you move forward in your parenting journey? I don’t know that I’ve ever tried to articulate what I do as a parent in terms of a philosophy. I’ve just done what felt right, what worked. I listen to them to find out what they need. I’ve always explained why when I’m asking something of them. I’m honest and open with them, if I’m grumpy and impatient I’ll tell them I know I’m over-reacting to things and that I’m sorry (but that they’d better bloody well cut it out or my head will explode!) I tell them I love them all the time. I make a conscious effort to notice and say thank you when they do good things. I tell them how proud I am when they make an honest effort at something. I’m looking forward to watching them grow up (a lot!) and as we approach the teen years I’m conscious of the need to keep communication lines open and of the potential difficulties that come with negotiating the transition from authority figure to friend. I hope that I’ve established a strong enough foundation of trust and respect between us that when the hormones kick in it doesn’t get too horrific! But mostly I just plan on taking things as they come. 3. I know you love to read. What 5 books have had the greatest impact on your life? Cat’s Cradle by Kurt Vonnegut – my first encounter with serious hard sci-fi, this was lent to me by my year 7 English teacher. The Bible – does that seem an odd pick for an atheist? I grew up as a member of the Uniting Church (an organisation for which I stil have a great deal of respect), my understanding of human nature, my ethics and my morality have as a foundation things I learned from reading and discussing the Bible as a child and teenager. It would be dishonest of me to leave this complicated, beautiful, terrible, very human book off this list. One day, possibly when I was still in primary school, maybe early high school, I picked up a book from my parents’ shelves, the title of which I don’t even remember. It was a history of and comparison of religions. Learning about the history of religions and the huge variety (and also the sameness) of religious thought across time and cultures was both fascinating and enlightening. I’m going to have to stop at 4 because I can’t pick out any other single book as having had a notably significant impact for me. Everything I read teaches me something, that’s one of the things I love about it. 4. What is your Aussie impression of the US? If you could have a 5 minute, private conversation with President Obama, what would you tell him? What do you want Americans to know about Australia? Oh my. This one’s a bit tricky. See, my last in person experience of the US, back in 1985 was as a miserable 14 year old who had been dragged away from her first boyfriend to come and live in Boulder, Colorado for 5 months while her father was on sabbatical and working at NCAR and the HAO. I hated it. My favourite shows were not on TV, and we had no money to spare so we didn’t have cable. I felt out of place at school because the subjects everyone else was doing didn’t match up well with the Australian curriculum and I ended up with a very peculiar timetable which had me spending time with and befriending people who were up to 3 years older than me. On the up side one one of those older friends saved my sanity by turning out to be a D&D playing, sci-fi reading geek and thus a veritable soul-mate. Plus, she lent me all her Alan Dean Foster books to read – thanks Kris, I wish I’d managed to keep in touch with you back in the days of snail-mail. I don’t see the US as a monolithic entity that it would be reasonable to make any blanket statements about. I feel resentment at the ubiquitous American cultural influence on Australia but I have a passionate love of certain American TV shows. I hated the way the Howard government sucked up to the Bush government but I know that Australia does benefit in certain ways from a close diplomatic relationship with the US (there are some big disadvantages too unfortunately). I’m disturbed by the level of hatred shown by some sections of the US population to other human beings but I know there are people just as bad here in Australia (and everywhere else) and that there are many Americans who fight every day for an end to such prejudices. What do I want Americans to know about Australia? Hmm, let’s see…I know! You know all those stories about Australia’s dangerous, deadly wildlife? They’re ALL TRUE! Especially the one about drop bears. Also, Vegemite is the most delicious thing ever and you must try it one day. 5. Why do you blog? What got you started? What do you get out of it? For me blogging is a creative outlet, a way of participating in a community and a way to record things that I don’t want to forget. Way back in my teens I was a pretty regular diarist (note to self: you really should dig those old diaries out and get rid of at least some of them – yes, I’ve still got them) but I hadn’t done any journaling for years. I didn’t keep a pregnancy diary, I never filled in those Baby Books I was given when the kids were born and I was an absolutely chronic at forgetting to bring the camera when we went out somewhere. When I started Weight Watchers (again) back in Feb ’06 I got involved with the forums. WW, in their wisdom, has very limited forums – no pics, peculiar defaults for the display and sorting of topics and threads etc – so many people were keeping a blog to document their “weight loss journey” and I hopped right on board. When I look back over the first, say, 18 months or so of my blog I’m sometimes tempted to do some pruning. There’s a lot of stuff in there that irritates or saddens me now but there’s also a bunch of kinda cool stuff too and my past is part of who I am today so I baulk at getting rid of it. By now I’m thoroughly hooked on the journaling aspect of blogging, I’m now prone to responding to events by reaching for my camera and thinking “I have to blog this!” (I’m not always quick enough with the camera though.) I have visions of the kids, or indeed myself, reading this stuff years from now (to which end I may use this one day). I love being part of the blogging community. I love the laughter, learning, challenges to think, companionship, the chance to commune with like minded people, the discovery of common ground in diversity. And I get a huge kick out of the fact that there are people out there who have never met me and actually want to read what I write. Yeah, time to ‘fess up, it’s all about the ego boost folks. So leave comments dammit! lol, all right, all right, leaving a comment. Well, I’ve only just started reading you regularly, but you write interesting posts and you write them well. Some interesting stuff in this interview! Um, I’m sure your more established readers will come up with more personal or stimulating questions, but you’ve got this from me. You said recently that ‘I am fascinated by the origins of words and the development of languages.’ Have you a favourite word or any thoughts on language development you’d like to share? Also, I’d love it if you’d interview me! now thats an interesting meme- the frige looks amazingly similar to mine and although i am not a huge fan of coke, sometimes i crave it- go figure. 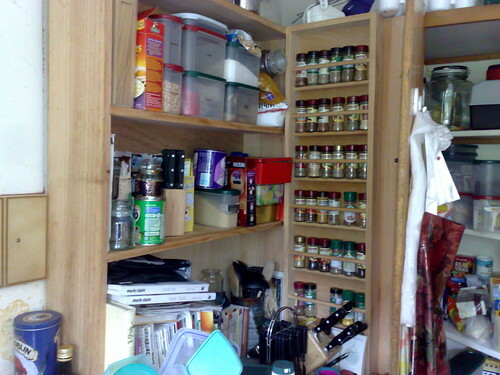 i recongnise the pantry too- thye say our kitchen reflects our lives, so i am thinking you are busy and full ! I like that you list the Bible as one of the books that has had the greatest impact. I think it’s so important to understand religion (not necessarily belive) to live within a culture and to relate to and understand other cultures. If only our fridge looked like that. It is never that full. I have lots of fond memories of sitting in your kitchen having cups of coffee together. I’m getting all nostalgic now. I also think it is interesting that you have listed the Bible – it is actually on my to read list somewhere in the future. What bothers me at the moment is how the kids do religion at school and I haven’t really followed what they have done. Bad mother! Last week though, I looked up the relevant passage that Nick had done and read it in English, just to compare. I’d love you to interview me, if you feel so inclined. First, I’d never heard of Blog Booker. Thank you for that!! What I really need is something similar for a message board. That way I could get a book of the journaling I did during my pregnancies and my kids’ infancies. Second, I wanna come eat at your house. Third, I love your book list. Fourth, I think you have more of a parenting philosophy than you realized! I love Vegemite too. We lived in Europe for a year and I missed it terribly. I’m glad you wrote about your US experience too because that is what happened to me for that year we lived overseas (similar age, similar issues). Well, snap on the whole Hobbit and LOTR and Cat’s Cradle thing. I had an uncanny moment of thinking we’d merged. Cheese, yum. It deserves a central part in any fridge. I for one am glad that you blog Mim. You never know what topic you’ll cover next! Yeah, the coke is probably ours… well Di’s actually. Sorry about that one. The Hobbit and the Bible are on my most influential list too. Only the latter is there because reading it ended my fling with Christianity.